Please no bullying, no use of profanity, and no fighting. 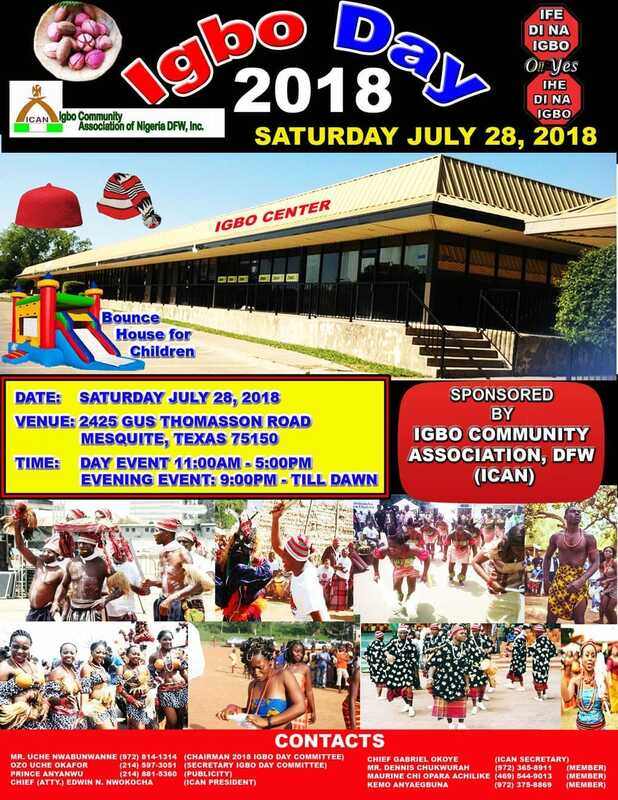 Let’s represent our rich IGBO Culture positively, while having fun and networking. ​The new executives of YICAN, the chairman of the Igbo Day planning committee, Mr. Uche Nwabunwanne and the first lady of ICAN DFW, Chief Attorney Cordelia Nwokocha met last Saturday at the Igbo Community Educational And Cultural Center to discuss the upcoming YICAN Igbo day, and the new structure that YICAN is going to take. ​The YICAN executives present at the meeting are, Ms. Crystal Ohaegbu (President), Ms. Angelica Ogbonna (Vice-President), Mr. Sid Onyekwe (PR, Head of Social Media), Ms. Precious Atasie (Secretary), Ms. Ifeoma Lewanika (Talent Show Coordinator), Ms. Augustina Ezenagu (Fashion Show Coordinator). The new executives will be sworn in July 27, 2018 at Igbo day.